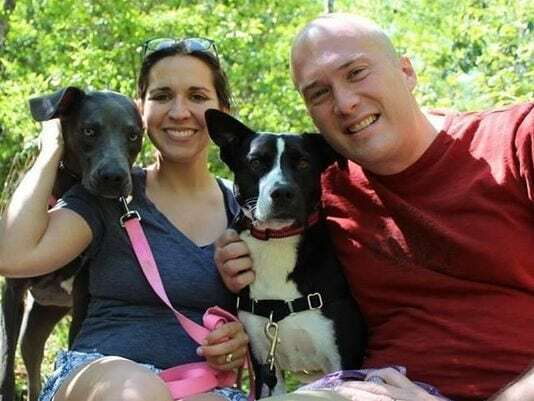 Olivia and husband Seth Hatfield along with their two dogs, were driving back home to Nashville, Tenn. from a family reunion when an 18-wheeler veered into the lane they were driving in. This ended up causing a terrible wreck where Olivia was badly injured and Seth was also pretty banged up. What made matters worse, both dogs, Molly and Claire had run away in the chaos that followed. After the accident, Seth escaped the vehicle with some cuts and bruises, and was fairly banged up, but nothing too serious. Olivia on the other hand had to be airlifted to a hospital in Birmingham, Al. where she was put into a medically induced coma. While she was being rescued from the wreckage, both Molly and Claire, the Hatfield’s dogs managed to escape the wreckage on their own and run away. Elliott Thomas, one of Olivia’s longtime friends found out about the accident, and the missing dogs as well. When Thomas went to work the day after finding out, he just couldn’t keep it together, and his boss told him to go be with his friend. On his way down, Thomas caught wind of the dogs having gone missing. He immediately pulled off the highway, where the scene of the accident was, to see if any of the dogs were still wandering the area. The accident scene was about 50 miles away from where Olivia was at the hospital in Birmingham; it was roughly 250 miles from the Hatfield’s home in Nashville. It couldn’t be more foreign territory for the dogs. Upon arriving at the scene, Thomas was surprised to see two vanloads of people, all searching for the dogs in the area around where the accident happened. When asked, they told him they were looking for Molly and Claire. 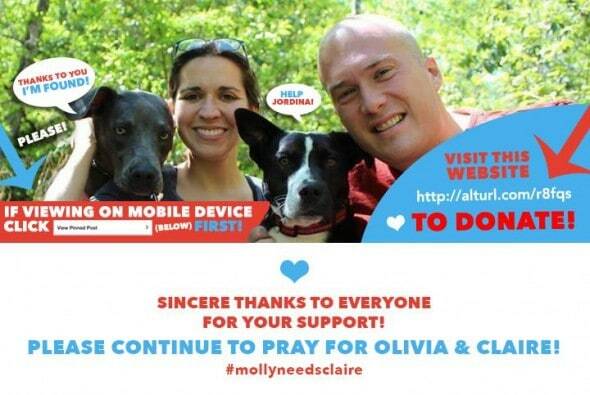 Thomas found out that a Facebook group, calling themselves “Help Find Molly and Claire” had been established to get word of the missing dogs out there, and ask for volunteers to help look. Now, that group has over 3,000 members, and Thomas couldn’t believe his eyes as day after day, more and more people showed up. Complete strangers, willing to help out fellow dog lovers in there time of need. “It’s very easy for people who have pets to put themselves in that scenario,” said Thomas. On Tuesday, the 8th of July a search member at a local shelter said someone had called saying they had found Molly. The dog had Tennessee tags, and the phone numbers on them matched the Hatfield’s. It was official, Molly was safe and sound. Molly, as it turns out, was staying with the neighbor of the lady placing the call to the shelter that morning. The dog was thought to be a neighborhood dog, and was with the neighbor for about three days. Claire is still missing, and now the hunt is on for her. The good men and women of the Facebook group set up a fundraiser, and pooled together somewhere around $2,500. The money has been used to hire a professional dog tracker from New Jersey. The dog tracker and her team of search and rescue dogs will be covered for about four hours of “paws on the ground” searching by the $2,500. The Facebook group is asking people in the area with game cameras and large humane traps for help as well. If you’d like to view the Facebook group’s page, or donate or volunteer, click here. Thomas has been blown away by the outpouring for love and support for the Hatfield’s and their dogs. Most of these people helping have never met the Hatfield’s, ever. Never the less, they are proving that dogs are family, and family is important to everyone. No matter what. Prayers to the family….now that Molly is found lets keep hope up that Claire is found soon and safe so when Olivia awakes she knows her babies are safe and waiting patiently to see her back at home. Thanks to all of those amazing search people and to the rescuers that are looking for Claire.